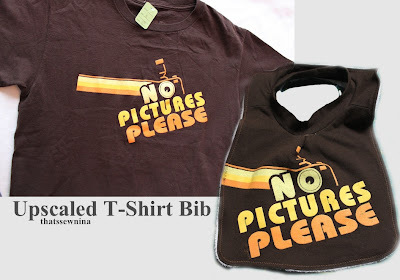 So my favorite bibs for the girlies are these over-the-head t-shirt bibs that I picked up at Alco (have you ever heard of this store? No? Then you’re not from a small town in North Dakota) when I forgot to pack a bib on a visit to the in-laws. I occasionally see this style in stores but not often enough to build up a collection. When I kept seeing “upcycled” t-shirt projects on pinterest, I thought I should really try to make my own t-shirt bib using a thrift store t-shirt. Check! …and they turned out so cute! Find a funky t-shirt at a thrift store… or really just pull an old t-shirt out of your closet if you want to be simple about it. Trace out the pattern and cut your pieces. 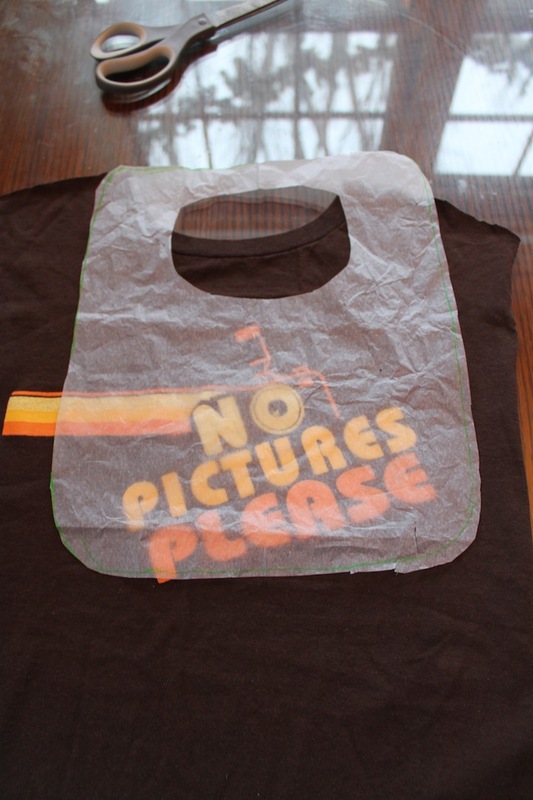 (1 of the t-shirt, 1 of your terry cloth or other backing fabric) I traced my pattern on tissue paper so that I could line up how I wanted the image to appear on the bib. Match up your front and back right sides together. Sew the outer edge of your bib with a ¼ inch seam allowance. Trim your seams to neaten them up. 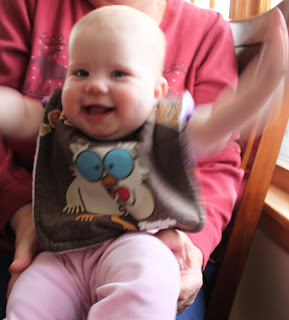 Turn your bib right sides out. Press with an iron. 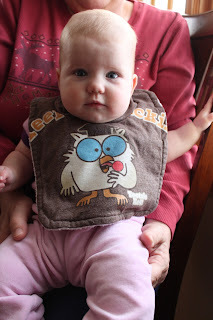 You might notice that I have an extra seam attaching the top part of the bib to the bottom with the image. When you cut out your picture from the t-shirt you’ll likely find that you run into the t-shirt’s collar so I just cut my pattern at the shoulder and added the extra seam. Use a tape measure to measure the size of your neck opening. If you’re using my pattern, it should be about 15 inches. Cut a piece of your remaining t-shirt the length of your neck plus ½ inch (to allow for a seam). 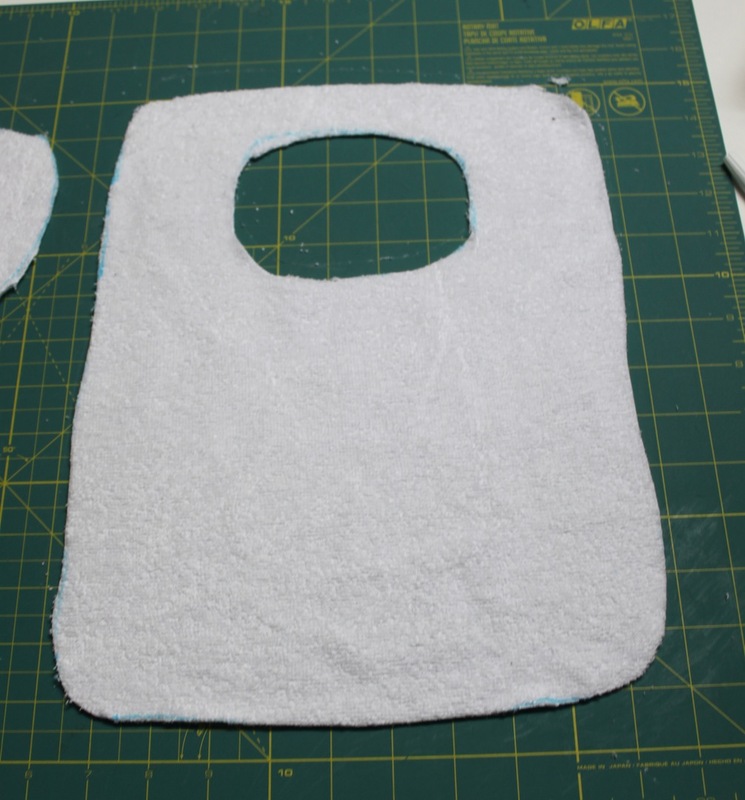 Cut the piece two times the width you want plus ½ inch for the seam. I kept it simple and just made it 2 ½ inches. 15.5" x 2.5" if you're using my pattern. 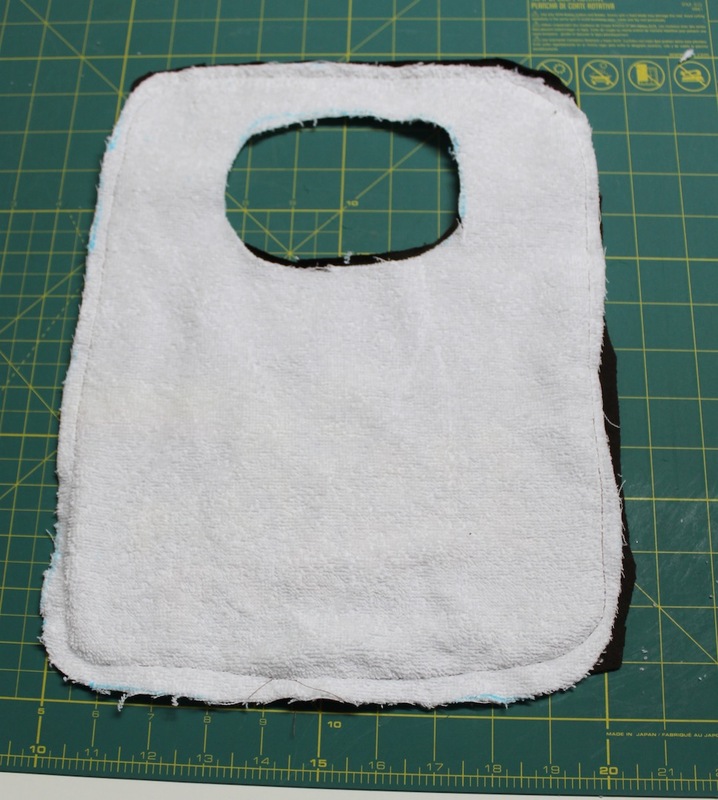 Fold your piece in half lengthwise and sew the edge together to create a circle. Iron your seam open and fold in half widthwise and iron again. Optional, sew a zig-zag or regular stitched seam along to the bottom to create a neater edge for your final seam. Pin the raw edges of your collar to the raw edge of your neck opening. CAREFULLY sew your collar to the neck opening. Take your time and check the seam as you go to make sure you’re sewing through all of the layers. If you struggle with this, make sure you sew the bottom edge of your collar as above and/or the sew the two layers of your neck opening together before you do this seam. It will keep the layers together and make this step a little easier. Zig-zag or serge the edge to clean it up. Sew a final finishing edge around the outside square of your bib to keep all of the layers neatly together. Use a zig-zag or decorative stitch if you’re feeling fancy. look at how thrilled she is! Wow! I am always impressed when people makes new things out of the old ones, just like this bib. The tutorial is very nice. Thank you for sharing this one!